I first encountered Michael H. Hanson’s verses through his frequent FaceBook posts…his rich, often timely entrees into the conversations of the day. Gradually, I came to associate his name—and his avatars—with a single word: gentle. No matter the darkness of subject or harshness of commentary, his words distilled the essence of gentlemanliness, of integral values so often passed over in today’s raucous, tendentious discourse. …there is a powerful undercurrent of reassurance, of normalcy, in its dependence upon the traditional, the tried-and-true, the cadenced modulation of ten- and nine-syllable lines that soothes even as the surface imagery pulls in the opposite direction. This tension repeats throughout the collection. At the heart of every poem is the fertile poetic tradition, often ignored in modern poetics, of rhythm and sound: tetrameters and trimeters, rhymes and slant rhymes. Indeed, When the Night Owl Screams provides an education in the subtleties of slant rhyme/half rhyme that seem to demand an oral performance to attain their full effect. The sense of the volume as a complete artistic entity—of every element of sound and sense purposely introduced and controlled—extends even to the physical presentation of the book. 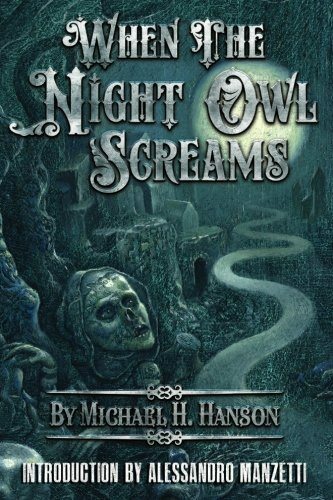 From the opening pages, with their various intricate and graceful Victorian-like scrollwork, to each individual poem, enclosed in an equally graceful and appropriate frame that suggests but does not insist upon the season, When the Night Owl Screams gently demands to be seen as a unity, visual and verbal, each element enhancing the other. But at the core, of course, is the poetry. Hanson leaves no doubt that—his neo-Victorian sensibilities notwithstanding—he is a contemporary poet of darkness, of threat, themes epitomized in “Black and White,” with its evocation of darkness overshadowing light. More explicitly, if such were required, is “At StokerCon,” a tribute to the art and artists of Horror and to their community. “The Projectionist’s Poem,” while emphasizing the lonely, flickering existence of the projectionist, is simultaneously monody for the ghosts that surround us. but all the blades aimed at our heart. and all that’s left are wispy hopes. Dark, potentially depressive, perhaps. But all in all, gently done. And skillfully woven.